On this page we will bring you word of new developments in the realm of the work of Karl Edward Wagner, and in the study of the man himself. Here you'll learn of new editions of his previously published writings, new printings of his correspondence, essays and - dare we hope -newly discovered unpublished fiction, and adaptations of his stories into other media such as graphic novels and movies. Karl Wagner's stories are in print in many countries and many languages, but damnably hard to find in his own United States. Therefore, horror fans are delighted to have a new edition of his horror stories in two volumes from Centipede Press. These are plainly labors of love, edited by his "friend and colleague," as the flyleaf expresses it, Stephen Jones. Two substantive volumes with smallish type were required to accomodate all Karl's horror stories, but the type is just big enough and the books just small enough to allow for reading in bed, reading oneself into an uneasy sleep on dark winter nights. I'm not usually a fan of photos as illustration (perhaps, in part, because I was once an illustrator), but photogarapher J.K. Potter (also author of the Harry Rowling series, I believe), has made a believer of me. I laughed aloud in the bookstore when I saw the back cover of the first in the series, Where the Summer Ends. The second volume is titled A Walk on the Wild Side. These are brilliant gems, indeed. Impurities in gems are referred to as inclusions, and the second of the two books has one rather unfortunate inclusion, an article by David Drake titled "The Truth as Far as I Know" or something like that. I am baffled as to why a man who considers himself Karl's friend would have included this article in a set of books paying tribute to the man. I'm sure he had his reasons. I will only say that Karl told me a bit, in an off-handed, no-big-deal kind of manner,about some of the topics that Drake reveals to us as a grotesque assemblage rather like the thing floating in Bradbury's "The Jar." Another slight flaw in the first gem is a sprinkling of misapprehensions regarding Karl and his work. First is the statement that Karl, while in medical school, had been inspired by the Robert E Howard's character Conan to create his own variant, Kane. In fact, Karl was already developing the character of Kane in his first years of high school, maybe even sooner. At that time Conan was unknown to our generation, and would not reappear in the states until 1967 in the first Lancer paperback. By that time Kane was well-fleshed out in Karl's mind. He'd shown me early versions of both Bloodstone and "The Treasure of Lynortis" (eventually printed as "Lynortis Reprise") around 1960. His principle influences, other than the Bible itself, were Victorian gothic novles, notably Melmoth the Wanderer and The Worm Ouroboros with a sprinkling of the pulp stories of C.L. Moore, Fritz Leiber, and others, and the early work of Michael Moorcock. He was also much influenced by James Branch Cabell, and his stories in high school echoed Cabell's sardonic style. Had Karl not encountered other influences later on (and, yes, Conan was eventually factored in, no doubt), I think his work would have most resembled that of Jack Vance. Kane vs. Kane Just as Karl’s only series character Kane is slouching tocanner, an unexpected source of danger has appeared from one long thought an ally. Treachery within the pages of an adventure yarn is one thing; among real flesh and blood publishers it cannot be excused. and, in particular, on his description of Kane. Those images have appeared on numerous editions of these works, and have become fixed in the minds of millions as the official aspect of Kane. Frazetta was so popular he was able to demand favorable terms, which included second use rights. This he exercised by re-selling the covers to be used by the rock group Molly Hatchet. Karl was a big fan of rock and roll, and had no problem with that. But now the paintings have been licensed for a third use, and this one is unconscienable. Whether there were restrictions against reusing the covers for purposes that would be in direct competition with their original purpose I don’t know. Karl’s estate is being managed by his siblings, and they are not prepared to deal with being blind-sided in this way. Copyright and trademark law is an especially nebulous area of the law and Jimmy and Audrey lack legal expertise. Following on the success of the Death Dealer graphic novel based on a Frazetta painting (I don’t know its original purpose), Image comics decided to repeat their success, and asked Mark Kidwell to choose another. When he chose a Kane cover to base his story upon, according to Kidwell himself, the publishers responded with, “You’re nuts!” Perhaps they were considering the legal ramifications. Even the first word in the title is unchanged. In describing his selection process, Kidwell mentions the use of these paintings as Molly Hatchet covers, but never hints at their original purpose, as representations of Kane. I doubt that is because he was unaware of the fact; he says he spent hours looking up Frazetta images on the internet. I suspect failing to mention that these were Kane covers was deliberate. 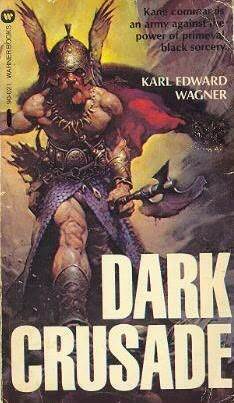 Mind, these are not some of Frazetta’s generic fantasy covers; these were covers that portrayed Kane, in particular, based on Karl’s description of the character. They are to be used as covers for one or more graphic novels about a red-haired swashbucker who is drawn to be the figure on the cover who was painted to be Kane. The possibility for dilution of the Kane trademark and copyright is quite real. Though I was involved in the business of intellectual property for many years and have a good layman’s grasp of its principles, even seasoned copyright lawyers grapple with its particulars. Whether this particular arrogance merits legal action I am not able to say, but it certainly merits action on the part of fans of fantastic literature. Until Image remedies this affront to Kane fans I urge that everyone find something other than Image comics to read. And let them know about it. The production of the first Kane movie, Reflections on the Winter of my Soul, based on the first novella in Death Angel's Shadow, remains in progress. Apparently it takes a long time to make a movie. I’m told the script has been firmed up and locations have been chosen. And a director has taken the helm. The blog Sorenz.DK says, “Producer Lauren Moews' Tonic Films har fået rettighederne til Death Angel's Shadow, en samling af 3 korte historie som alle omhandler sci-fi forfatteren Karl Edward Wagner's udødelige anti-helt Kane.” Of course, I’m on record as objecting to the use of the term ”anti-helt” to refer to Kane, but maybe the term has a different nuance in Danish. Please join the Karl Edward Wagner forum linked from the homepage to offer your own thoughts on a critical issue to Wagner aficionados: who shall play Kane? My own preference is for an actor massively muscled, as Karl desribed him and as I drew him. Others would prefer someone who can act. I feel that to be a slur upon those of us with >ahem< good pysiques; no reason an actor can’t have both attributes. If that proves too difficult, though, perhaps a power-lifter could be voiced over by some great Shakespearian actor. Heck, if they can lip-synch a zebra, it shouldn’t be much harder to lip-synch a power lifter. Of couse, I’m talking a power lifter with good definition, mind you, not one of those working to build a lower center of gravity.